I want to inspire a generation of people who are scientifically literate, and maintain their childhood curiosity and sense of wonder for the world around them. We are all born as explorers, and children are always exploring the incredible world around them. As such, they have this indescribable sense of wonder at learning new things. I think the world would be a better place if we could encourage and support people in maintaining this love as they grow up. To do so, we need to have better education, and in particular, better STEM education. By better, I mean more comprehensive but also more focused on creativity and curiosity. I believe that everyone can be involved in STEM and can love and find joy and wonder in science. That said, it’s essential that we realize that not everyone is going to have a career in a STEM field, and that that’s not a bad thing. We place so much importance on students learning math, science, etc. not to teach them to always stay curious, but rather to pass a test or to become an expert in those fields. As such, students who aren’t especially talented or interested in STEM feel ashamed when they don’t meet these expectations. They start to dislike STEM, and ‘turn off’ from learning it or taking an interest later in life. But if we could teach STEM subjects from a position of understanding that everyone has different talents and moves at a different pace, I believe we would have a lot more people who as adults continue to find interest (and more importantly, understanding) in STEM, not as professionals, but as people living in a world where science impacts our every moment. 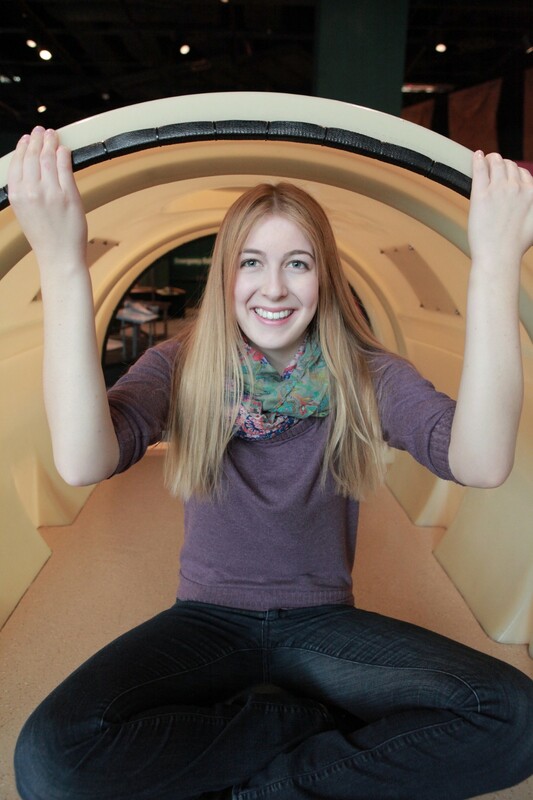 As a part of my series about strong female leaders, I had the pleasure of interviewing Abigail Harrison (more popularly known as Astronaut Abby), is an aspiring astronaut with the goal to be the first astronaut to walk on Mars. From an early age, Abigail devoted her interests to human space exploration. Now, as a young adult, her personal development — as a pilot, scuba diver, skydiver, marathoner, research astrobiologist, student of languages, science communicator, and public speaker — drive her pursuit of her goal. 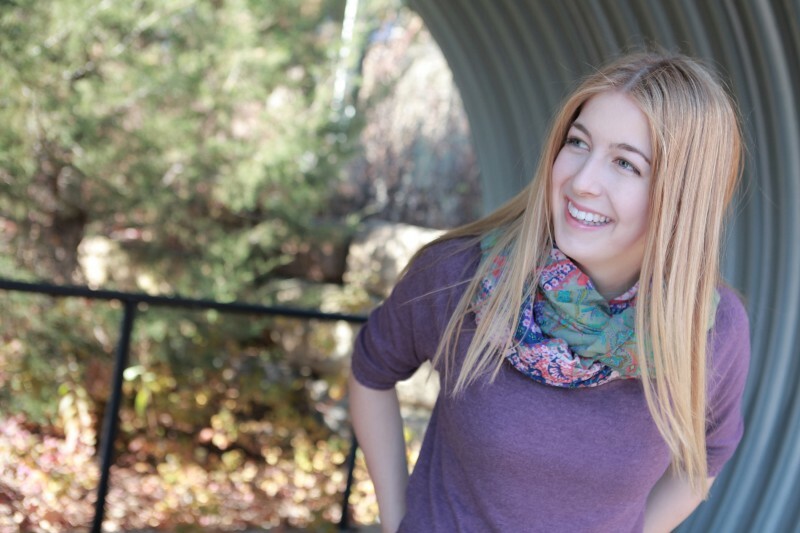 Beyond a personal aspiration, Abigail has leveraged her passion to excite and inspire other young people about STEM and space. She founded The Mars Generation (TMG), a 501(C)(3) nonprofit, to elevate the focus on space travel for her generation, the generation most likely to be the first to reach Mars. Her leadership and community-building efforts have motivated others to pursue education and even careers in STEM. And, maybe more importantly, to support and encourage young people and their families who are the most underrepresented in the areas of science and space. 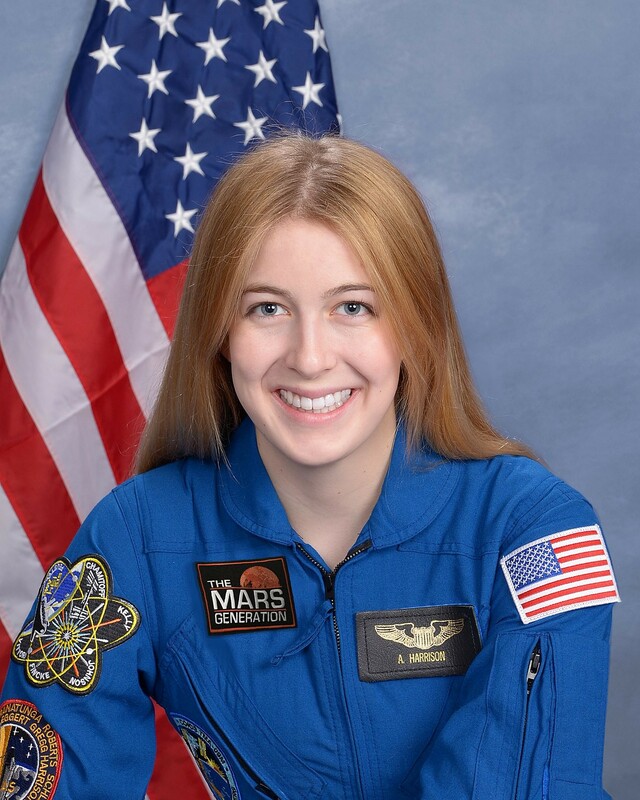 Abigail has been sharing her journey toward the red planet on social media ever since she was 13 years old and is now a well-known YouTuber and Instagrammer with over a million followers on her collective social media channels. In its fourth year, her nonprofit has more than 1,800 students worldwide participating in an innovative Student Space Ambassador leadership program which provides resources and mentorship to allow young people to share their love of STEM and space with their local communities. Abigail and TMG have sent 36 youth experiencing poverty on full scholarship (including transportation) to Space Camp in Huntsville, Alabama and reached millions of people through online outreach. She will graduate from Wellesley College in 2019 with degrees in Astrobiology and Russian and plans to pursue a PhD. She continues her work as an active astrobiology researcher, begun during her Mars lab internship at Kennedy Space Center. I’ve wanted to be an astronaut for as long as I can remember. My earliest memory is actually of looking up at the night sky and watching the stars in absolute enthrallment, just completely awed by the universe we live in and how much we still have to learn and explore. This excitement about exploring our universe caused my parents, teachers, mentors and others to guide my education path as a young child towards STEM, which was a perfect fit. This amazing support from so many people while I was young led me to my career path, which is to become a scientist and hopefully someday to become an astronaut. There is one mortifying and hilarious mistake I’ve made that I guarantee no one else has ever made (or at least I don’t think they have). It was about three years ago, when I had just started my nonprofit, The Mars Generation. I was in the Wellesley College library (I was about a month into my undergrad studies at Wellesley College) and my phone started ringing. I pulled it out of my pocket, didn’t recognize the number, frowned and hit decline. A couple seconds later it started ringing again. Frustrated, I declined the call again, assuming it was a telemarketer. I’m sure this is generational, but I rarely use my phone for actual calls, and when I do they’re usually prescheduled (such as interviews) or family. About five minutes after these two ‘spam calls’ I got a call from The Mars Generation’s Executive Director. I answered to hear “What the heck are you doing?! Buzz Aldrin just called ME and said he’s trying to talk to you and you keep hanging up on him!”. Buzz Aldrin, the second human to walk on the moon, was unexpectedly calling me to talk about the future of human space exploration and the importance of inspiring the next generation, and I was hanging up on him. As terrible as that was, it actually gets worse. I called him back and ended up spending so long on the phone with him (it’s Buzz Aldrin- I was going to listen for as long as he wanted to talk to me) that I was late to my Physics lab. As I mentioned, I was brand new at school, and in general I try to keep my personal life pretty separate from my Astronaut Abby work. I walked into the lab about 25 minutes late and went to my Professor and whispered to him that I was sorry I was late, but that I’d gotten a surprise call from Buzz Aldrin. He gasped out loud and then in full volume “teacher voice” called the class to attention and asked “Raise your hand if you know who Buzz Aldrin is?” Of course, everyone in the class raised their hands. Then he asked “raise your hand if Buzz Aldrin has ever called you.” Everyone else slowly lowered their hands, and there I was, standing with my hand still up and blushing profusely. That was quite a humorous mistake, and I definitely learned from it. I learned to always expect the unexpected, because in this day and age with all of the ways that we have to connect you never know who is going to hear your story. I also learned to start answering my phone. I think The Mars Generation stands out because we’re an education organization but we present ourselves to the world as a hip and fun online resource for people of all ages. The whole idea of The Mars Generation was to use 21st century resources to make STEM and space exploration accessible to people everywhere. Space exploration is an endeavor that all of humanity is a part of, and as such, it’s important to include as many people as we can in the process. The majority of our work is done through social media and digital communications. We are a nonprofit founded on the backbone of social media. We are using social media to attract people (students or adults) to take interest in STEM. Our approach is to make STEM fun and relevant, proving that STEM doesn’t have to be stuffy and academic. As for my work as Astronaut Abby, I think it’s really unique for a couple of reasons. Growing up as a part of Gen Z, I was one of the first kids to go online, specifically to share a big dream with the world, and then invite people to join me and follow my journey. Over the past 8 years my followers have watched me grow up and have experienced this journey with me. My adventures are their adventures, and someday when I walk on Mars, I will place a footprint that is not just mine, but that of millions who have followed my journey over the years. Additionally, I believe I am one of the only (if not the only) social media influencers out there who is completely philanthropic. Every paid instance I have participated in as a result of my online presence (whether it’s keynoting conferences, attending premiers/events, or appearing in commercials) I have donated 100% of the payment to The Mars Generation to further the future of science literacy and space exploration. I have a couple irons in the fire… I’m taking a gap year (once I graduate from Wellesley College in May of 2019) before going to grad school and have been piecing together different things to do during that year. I don’t want to give too much away, but I hope to expand the reach of The Mars Generation and continue to be a role model to women and girls around the world in an even bigger way than I have already done. I promise there will be some exciting adventures in store for my followers in the next year. I would advise other female leaders to really lean into the strengths of their teams. I honestly believe that everyone has a talent/strength, but they are not always visible or fully utilized. Being able to help people find and develop these talents will help them to take pride in themselves, their work, and will overall make the entire team thrive. Also, women need to realize that we cannot do everything ourselves and identifying our own weaknesses and bringing in others whose strengths can compensate for those weaknesses is an essential component of success. I would advise other female leaders to not take on too much of the emotional labor and to make sure that no one else on their team is taking on an unfair share either. Emotional labor can take on a number of forms such as feeling a need to smile and act positive to improve other people’s day, making small talk so that situations are more comfortable, mentoring new team members, even something as simple as making coffee or organizing a birthday card for a team member. It’s all the invisible and often unnoticed actions which make the world go round and which nearly always fall upon the shoulders of women. As a leader you, of course, will take on more of this and as women we are are often ingrained with the idea that we have to do everything. I believe that an important part of leadership is recognizing the invisible work and labor that occurs, and then dividing it appropriately, placing manageable loads on each team member’s shoulders. There are so many people who have helped me get to where I am today, from my 5th grade science teacher who identified both my interest and talent in science to my science coach who worked with me from the age of 10 through high school and continues to be a cheerleader. I also have my mother who has been a rock and has stood behind me and supported every effort I have made not only academically, but also my founding of The Mars Generation. My mom serves as the executive director of The Mars Generation and she is the backbone of the organization. She has taught me so much and it is her support that has made all my work possible. One specific story that I like to share about someone who has made a significant impact in my life is the story of meeting my mentor Astronaut Luca Parmitano. I met Luca in the Orlando airport when I was 13 years old. He took an immediate interest in my goals to become an astronaut and the first astronaut to Mars, and after talking to me for more than an hour he handed me his card and said “If you have any questions, please email me. I will be your astronaut.” Luca’s belief in me and my dreams and his offer to be open to my questions were instrumental in my own belief that my dreams really could come true.Here is an actual astronaut who is investing a bit of his own time and effort into my success. How could I not be inspired? Luca has been a cheerleader from that day on and his support has been so important to my own steps forward towards my dreams. The support and love I have received from so many people has been turned into my work with The Mars Generation and as Astronaut Abby. Through The Mars Generation and my work as Astronaut Abby, I hope to pass on what I have received as much as possible, to affect as many people as possible. I have been so fortunate and it’s such a privilege to be able to pass that on in so many powerful ways. Whether it’s through sending kids who live in poverty on full paid scholarships to Space Camp, inspiring thousands of students through the Student Space Ambassador leadership and mentorship program, or reaching millions through online outreach, I hope to continue this work far into the future as my own career as a scientist continues to grow. I want to inspire a generation of people who are scientifically literate, and maintain their childhood curiosity and sense of wonder for the world around them. We are all born as explorers, and children are always exploring the incredible world around them. As such, they have this indescribable sense of wonder at learning new things. I think the world would be a better place if we could encourage and support people in maintaining this love as they grow up. To do so, we need to have better education, and in particular, better STEM education. By better, I mean more comprehensive but also more focused on creativity and curiosity. I believe that everyone can be involved in STEM and can love and find joy and wonder in science. That said, it’s essential that we realize that not everyone is going to have a career in a STEM field, and that that’s not a bad thing. We place so much importance on students learning math, science, etc. not to teach them to always stay curious, but rather to pass a test or to become an expert in those fields. As such, students who aren’t especially talented or interested in STEM feel ashamed when they don’t meet these expectations. They start to dislike STEM, and ‘turn off’ from learning it or taking an interest later in life. But if we could teach STEM subjects from a position of understanding that everyone has different talents and moves at a different pace, I believe we would have a lot more people who as adults continue to find interest (and more importantly, understanding) in STEM, not as professionals, but as people living in a world where science impacts our every moment. I identify strongly with this quote because it reminds me how important it is to face fear head on. It also reminds me that failure is part of the process of reaching success and if you don’t face your fear head on and also risk failure you will never know what you could have accomplished. I would love to hang out with Brian Cox (@ProfBrianCox). I think he’s an incredible science communicator. He’s definitely been a role model to me as I’ve stumbled into STEM and space advocacy. I would also like a chance to meet with Melinda and Bill Gates, as I believe the work I am doing with The Mars Generation would be of interest to them because of their dedication to education. Of course, I would like to meet with Richard Branson, Jeff Bezos and Elon Musk — all entrepreneurs who have taken to investing in the future of space exploration and, honestly, I believe it would benefit them to meet and me because I represent the next generation of innovators and explorers. Finally, I would like to meet with Hillary and Chelsea Clinton. I have been a fan of Hillary Clinton for years and she is a graduate of Wellesley. I look up to the mother / daughter relationship they have as it reflects my own powerful relationship with my mom. I would love to have breakfast with them both and include my mom in that breakfast as well.